While Las Vegas used to be fairly “user friendly,” unions have tightened their grip on the city over the past five years. Especially rigorous are the regulations governing electrical services. If you have not exhibited in Las Vegas for a while, please review your Exhibitor Services Manual carefully for rules and regulations. Do not equate the fact that Nevada is a right to work state with liberty to do as you please within the convention centers. It is not the case. The teamsters union (Local #631) has jurisdiction for the erection, dismantling, touch-up painting, and repairs to all exhibits, unless this work is performed by a full time employee of the exhibiting company. If full-time company personnel are utilized to set an exhibit, they should carry positive company identification such as a business card, medical identification card or payroll stub. Teamster labor may be hired either through the general contractor or though an exhibitor appointed contractor, such as Absolute I&D. Teamsters also are responsible for freight handling, which includes loading and unloading of all trucks, handling of all machinery (unloading, uncrating, unskidding, leveling, etc., and the reverse process). An exhibitor may “hand carry” material provided they do not use material handling equipment to assist them. When exhibitors choose to “hand carry” material, they may not be permitted access to the loading dock/freight door areas. Stagehands handle programmable theatrical lighting, productions, related rigging and Audio Visual. Suspended trusses, with or without legs, that contain dimmable or programmable lighting, studio or motion picture lighting, sound system projectors, video walls, special effects equipment, and laser lighting are to be installed and removed by stagehands. Regarding hanging signs, please note that if it is not electrical (handled by the electricians), in Las Vegas, the General Contractor will assemble, supervise, install and remove all hanging signs. However, after the show, they often drop the sign and abandon it. It would be prudent to have an exhibitor appointed supervisor oversee the hanging sign work so that they will know how to pack the sign back up after the close of show. Electrical unions do electrical work, hang signs that are lighted or rotating, and work on any part of the booth that includes electricity (back lit headers, light boxes, clip on lights, plasma screens, AV equipment, etc.) An exhibitor may plug-in their equipment into the 1 (one) 20amp/120 VAC receptacle per booth and hand up to 4 (four) small clip-on lights per booth. An electrician must be called for any increase in electrical service. The list goes on, but you can figure if it in anyway involves electricity, the electrical union in Las Vegas will be trying to enforce their right to work on it. 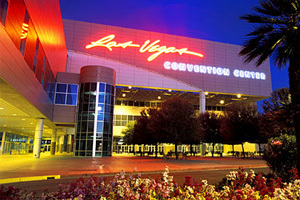 Also note, at the Las Vegas Convention Center, there is a ban on certain halogen lamps. Halogen lamps are limited to 75 watts and must be of the sealed variety. Your exhibitor kit will have more details. Straight time in Las Vegas is from 8:00 am – 5:00 pm, Monday through Friday. Lunch is from 12:00 – 1:00 pm. While the general contractor usually offers an overtime and a double time rate, many independent contractors offer only a single overtime rate. This is because it is generally necessary to pay the more qualified labor personnel at the higher scale in order to retain their services. Since this is the labor pool that makes up the resources of exhibitor appointed contractors such as Absolute I&D, they often offer only straight time or over time. If you would like to receive a free quote for you trade show exhibit installation and dismantle in Las Vegas, please call us at 1-866-685-8950 or complete the form below to have someone reach out to you. Are you ready for us to do your installation & dismantle? No, I need more information. Copyright © Absolute I&D 2015 All Rights Reserved.